All aboard the Alphabet Train! 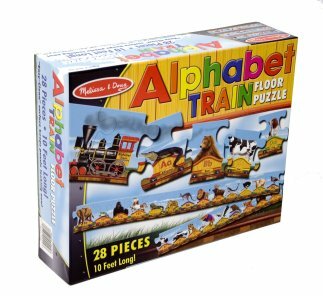 This large and colorful puzzle features 27 extra-thick pieces to make building it easy and fun. Easy-clean surface keeps puzzle looking new. 10 feet long! I use this in my preschool classroom. The kids love to sing the alphabet song, along with "Choo-choo!" But they are learning the alphabet while they play. Great experience! We bought this puzzle for our daughter when she was 2. She loved it then and still loves to put it together at 4. It has really helped her to learn what letters look like.